New Versus Pending Listings: Which Moving Leads are Best? MovingLeads.com provides a weekly list of moving leads that have just been listed “for sale” in your area. Occasionally, movers ask if we can provide leads that have a gone “pending” meaning the property is under contract and the move is imminent. It is very important to reach the homeowner early in their decision-making process. That is why our leads are always the newest listings. Here’s what we’ve learned about the life of a lead and why marketing to the newest listings has the biggest ROI. The milestones of a home sale greatly impact the timing of the response/call from each lead. Postcards are powerful and have a unique advantage over other forms of marketing. Unlike emails which get deleted or phone calls which are intrusive, homeowners hold on to postcards and use them as a resource until they are ready to make a decision. 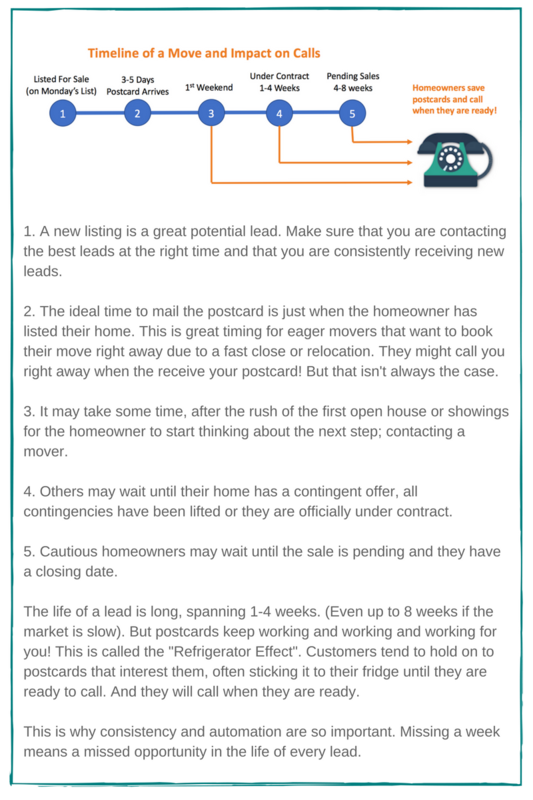 This infographic explains the life of a moving lead and why it is so important to consistently mail new moving leads as soon as they list their home for sale. By mailing at the right time, just as they are listing, you will receive responses to your mailings from the early decision makers, which you can see in Steps 2-4 of the infographic. But if you wait and only mail to leads that have entered Pending status (Step 5 of the infographic), your postcard may arrive too late in the research process. With MovingLeads.com automated postcard service, you won’t miss the opportunity to market to homeowners in the early stages. If you want to market to reach homeowners in the pending status, we can set up a follow up mailing to your original leads 4-6 weeks after the first mailing. This will catch most properties as they enter the pending stage. In our experience movers that have re-mailed to older leads have not seen a significant increase the response rate between the 1st and 2nd mailings. However, it is a good way to remind homeowners about your business and catch the homeowners that are still considering what mover to hire. We've been in the Moving Leads business since 2003 and have learned what results in the best response rates. That's why so many of our customers have been mailing with us for years. Consistent mailing of automated postcards to new leads is the best way to create a full pipeline of valuable moving leads. Let us help you create a successful direct mail program to grow your business. Simply reach out to us at 303- 443-0767. You can be mailing within a week!